With 5 million Danish kroner (£0.6m; €0.7m) dedicated to energy saving solutions the municipality of Thisted Kommune is serious about sustainability. And, Thorn is doing all it can to help. 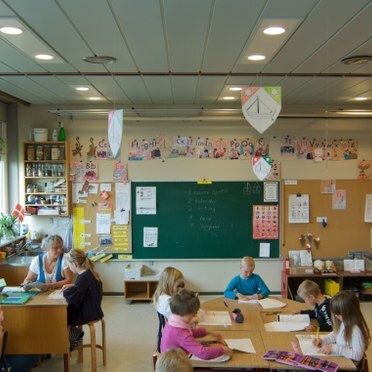 Pictured here is part of Hanstholm School in northern Denmark where Base LED 650 downlights have cut energy requirements by about 70%. The frames of ageing fluorescent fittings were easily conveted to accept a back plate complete with two LED downlights. Replacing twin 36W tubes in each light point, the Base LEDs have substantially reduced electrical consumption, from 90 to 24 circuit watts per unit, whilst still maintaining the same lighting levels. 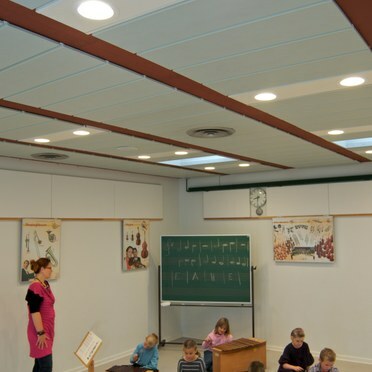 Lasting 50,000 hours, the downlights also require less frequent maintenance. In addition the benefits of a warmer colour with better colour rendering can be brought to the classroom. Little wonder that John Nicolajsen, Hanstholm's headmaster, is so pleased. "Both students and teachers have noticed changes, although it is only now, when darkness is pressing that we really enjoy more light. 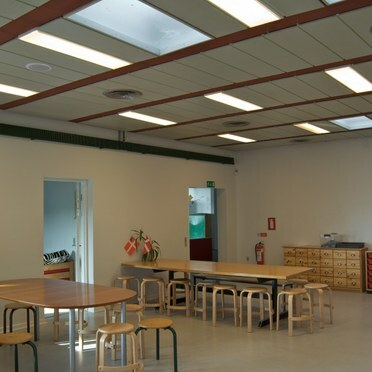 And I am convinced that the light is important for both learning and well-being at school." he says.